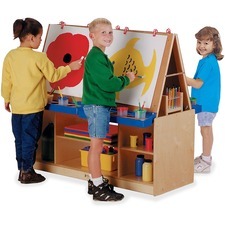 Foster artist creativity and keep art supplies within children's reach with this art center. Bottom shelves provide excellent storage between easels. Included clips and paint trays offer convenient storage and display options. MAXBrackets allow the art center to be moved easily without causing stress on the wheels and brackets. Wheels are made of hard rubber and won't leave black marks on your floor. Durable laminate features an easy-to-clean surface. Kickplate prevents children from losing their favorite items underneath. KYDZSafe rounded edges allow children to play safely without getting hurt by sharp edges or corners. Ultraviolet acrylic coating is durable and resists yellowing over time. Dowel-pin construction prevents weakening at the joints. 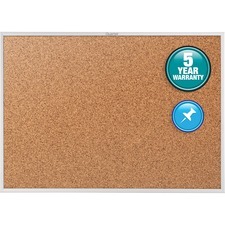 Corkboard features a naturally renewable cork surface for quickly posting reminders and notices. Surface is durable, self-healing and environmentally responsible. Trim is a sophisticated blend of materials, adding richness to any environment. Frame is made of silver anodized aluminum. 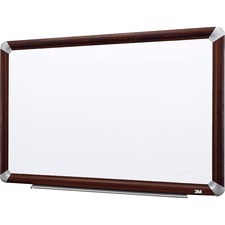 Dry-erase board with a wood frame is perfect for your planning and meeting needs. Large, white melamine surface offers plenty of space for you to write notes, ideas and other essential messages. 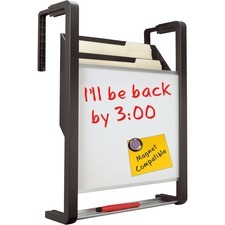 Included marker tray holds markers (sold separately) so you're ready to write. Wood frame is made of medium-density fiberboard. 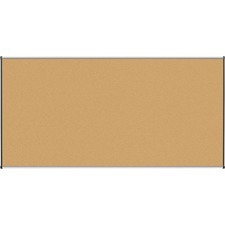 Durable 6' x 4' natural-cork bulletin board with heavy-gauge aluminum frame secures documents with push pins. Delivers effective performance in low-use break rooms or on factory floors. Self-healing surface. 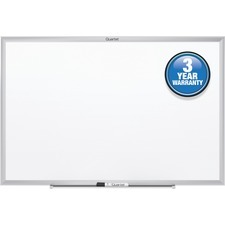 Quartet® Hanging File Pocket, 11" x 13", 3 Pockets, Magnetic Whiteboard - 11" (0.9 ft) Width x 13" (1.1 ft) Height - White Surface - 1 / Each Dual-purpose 3-pocket vertical filing system with built-in 11" x 13" magnetic whiteboard allows you to broadcast information and efficiently manage paper flow in your personal workspace. Hangs over most cubicle panel systems or mounts onto dry-wall surface. Built-in storage tray. 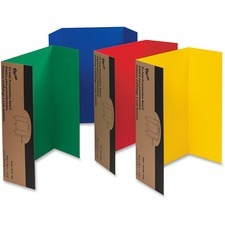 Tri-fold, single-walled corrugated display boards are used for projects, booths, science fairs and all types of displays. Each board is colored on the front and natural kraft on the back. Assortment includes equal numbers of red, green, yellow and blue. Boards are made with a high percentage of recycled material. 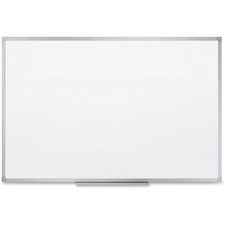 Dry-erase board features a durable surface that resists ghosting, staining and scratching. 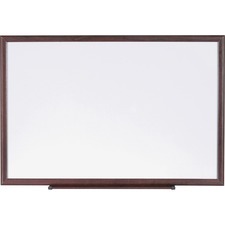 High-quality aluminum frame with a stylish mahogany finish and aluminum accents provides durability with an elegant look. Included marker/eraser tray snaps easily into place. Interlocking Fastener System includes mounting brackets plus Command Picture Hanging Strips to stabilize the bottom of the board.